Nepal Mountaineering Association (NMA) has classified 33 peaks in Nepal as 'trekking peaks' ranging from 5650-6500m into Group A comprising 15 peaks and Group B comprising 18 peaks. We arrange following peak climbing in Nepal, you should not worry any thing about peak climbing in Nepal. You will get all information , Itinerary, Guide, Equipments with us. Pisang Peak is considered one of the easy climbing peaks among the trekking Peaks in Nepal. 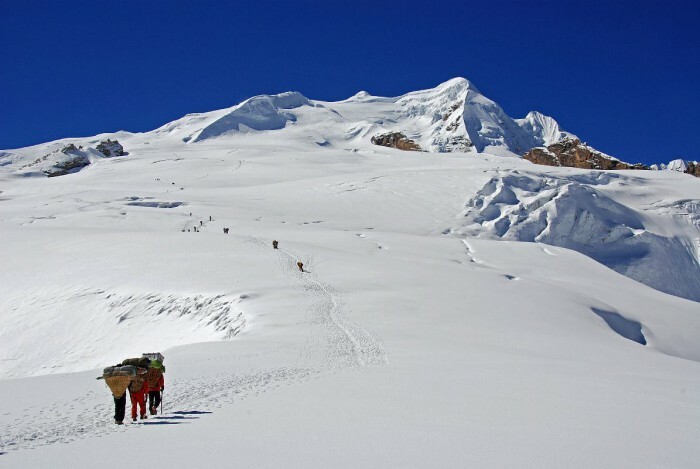 To reach the base camp from Pisang village, the path ascends through sparse woods and pasture to a kharka at 4,380 m which is considered the best place for setting up the base camp. Island Peak Climbing is the most popular trekking peak in Nepal. From dingboche the mountain is seem as an island in a sea of ice. Island Peak summit is interesting and attractive with a highly glaciated west face rising from the Lhotse Glacier. Situated in the Everest region to the east of the main Khumbu trekking trails, Mera Peak stands at 6654 m. The trail follows the original Everest expedition route from the roadhead at Jiri, crossing the high ridges and spectacular deep river gorges of the Sherpa homeland of Everest region before entering the less-frequented wilderness of the Hindu valley. Yala is an easy trekking peak in the Langtang Region of Nepal. The summit gives surprise good views of Langtang Lirung (7246), Dorje Lakpa (6990) and Shishapangma (8027) in Tibetan side if weather permits. Walking through the dense forest and traditional ethnic settlements you will reach to the wonderful base camp of Yala Peak. Naya Kanga Peak Climbing is the fifteenth highest trekking peak in Nepal. Naya Kanga Peak was formally known as Kanga Chuli.Naya Kanga Peak is situated in the southern flank of Langtang region of Nepal and towering over the south of alpine Langtang valley and holy lakes of Gosainkunda.